A LOT of FUN! WHO’S BAD had a great concert atmosphere. I’m not a big Michael Jackson fan, but I loved WHO’S BAD. The whole crowd of over a thousand at the Embassy of all ages was vocal and animated from the get go. Lots of the audience were stood up and singing along to the lyrics, I joined in singing all the lyrics wrong :-), but I didn’t care I never do, I’m rubbish at remembering lyrics. There was a great feeling in the Embassy Theatre, normally the audience at the Embassy can be a little hard to liven up with so many in the crowd unwilling to let their hair down and have fun. The cast of WHO’S BAD had no such problems getting the audience out of their seats and to their feet almost from the start, joining in with a lively and entertaining show. It was nice for once not to be in the minority of people in the Embassy on their feet and dancing and I had a lot of competition with my cheers, which was great. It was wonderful to look around the theatre and see a sea of waving hands with wolf whistles and cheering all through the show. We looked across at our son and asked him if he remembered any of the songs he said “No, but I’m enjoying it”, which goes to prove how good a show WHO’S BAD is and how easy Michael Jackson songs are to enjoy. Our son knew some of the songs later in the show like Smooth Criminal and Michael Jackson’s later songs from the 90’s, he was on his feet and clapping all the way through the show. There was so much audience participation which was fantastic and set WHO’S BAD apart from other similar shows we have seen, they ran around the crowd, got the whole audience singing, clapping and swaying. My hubby loved the show and your lucky to get him to enjoy anything other than Bon Jovi. I love Steve Steinman’s Vampires Rock Show, but WHO’S BAD put them to shame in getting the audience involved early in the show. The WHO’S BAD cast are so natural and relaxed at getting the crowd excited and involved. The trumpet player was the best at getting the crowd going and riled up, he was great at rapping and got the whole crowd bouncing and shouting, loved him! The whole atmosphere to WHO’S BAD was excitement and fun the crowd went nuts every time the lead singers came on stage and did the moon walk, there was two Michael Jackson tribute singers. Although not as big as a real Michael Jackson concert with backing dancers, the routines they did was good. I think there are 7 performers in WHO’S BAD. Drummer who was awesome, 2 guitarist, a sax and trumpeter who where also backing singers and wicked dancers and fun to watch along with the two lead MJ tribute singers. All of the band added to the show and they were having a lot of fun, this was their first UK tour and they enjoyed every minute of it. The only niggle I had was the setup and crew was not as high standard as other shows we’ve seen. During the first song the spot light (for the main singer) was all over the place, it was like he’d never used a spot light before (after the first song it was fine)! On the stage some spot lights that pointed straight at the crowd, every time they flashed they would blind you with a bright white flash, but they only came on occasionally and in the second half not at all on our side. I think one of them might have burnt out, thank goodness. This had nothing to do with the flawless performance and fun on stage, the cast were exceptional. The show didn’t last as long as we expected, it started at ~7:40pm, with a 20+ minute break in the middle and it was finished by around 9:30pm. The tribute singers mentioned several times they’d be singing Dirty Diana, but it it was not part of the Skegness show, so maybe the show was cut a little short that night? Most of the Michael Jackson songs are fast paced with the exception of two, but Michael Jackson was renowned for not doing many slow songs which is why Michael Jackson music appealed to me as a child so much. His music was always unique and original, all the songs I remember and love were included in the show like Smooth Criminal, Who’s Bad and Thriller, we even got the famous Thriller zombie dance. I did so much WHOOPing that I had a slight sore throat the next day :-) The shows final song was Man in the Mirror, one of my all time favourites. Who’s Bad left the Embassy audience screaming and shouting for more with feet banging on the floor and the crowd shouting for more in unison. They left the Embassy hanging a little while before coming back on stage which was interesting, normally other acts come out too soon for there encore, so I liked waiting a little longer. The trumpeter was awesome at the very end and finished the show really well wont ruin it for you (too much :-)). 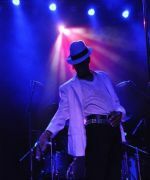 WHO’S BAD is a great show lots of fun for all ages and whether you are into Michael Jackson or not is a great night out. Everyone knows at least one song of Micheal Jackson’s, so go and see WHO’S BAD and be entertained. If you’ve seen WHO’S BAD! 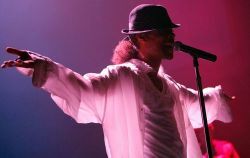 a Michael Jackson Tribute Band, feel free to make a comment below.